Go enjoy your holidays with Canadian Dollar Bingo and win over $30,000 in GUARANTEED cash and prizes. This special bingo 12 Days of Christmas contest patterns will start December 20th thru December 31st in our Main room. In addition to the special Christmas patterns, every day during the contest will give one lucky player a chance to shake our Christmas tree filled with additional cash and prizes. On January 2nd, 2019, Canadian Dollar Bingo will have a Grand Prize draw from all entries earned during our 12 days of Christmas Celebration. One lucky player will walk away with $1,000 CASH. Watch and Win the special 12 Days of X-mas Contest game patterns and you´re on your way to winning. Christmas Wreath, Christmas Tree, Christmas Bell, Snowflake, Reindeer, Gifts, Hot Cocoa, Blanket, Candy Cane, Santa’s Cookies/Milk, Basket Gift, Santa’s Letter, Ginger Bread, Poinsettia, Ginger Bread/Sugar Cookie. All the online bingo fun starts tonight. From Friday November 9th and until Sunday November 11th you can play Remembrance Day Bingo. Canadian Dollar Bingo will pay tribute to the members of the armed forces who have died in the line of duty to protect our country’s freedom with a $5,000 in GUARANTEED CASH Poppy Flower Event. Join in to play the POPPY FLOWER JACKPOT GAMES in the Main Room and celebrate with Canadian Dollar Bingo. This holiday has great honor and respect for this great nation. We will not forget… we will fill our Main Online bingo Room all day long with poppy flowers as symbol of appreciation and respect for our war heroes and their families. PRE-BUYS AVALABLE. Ready for the vacation of your dreams? Canadian Dollar Bingo is giving you a chance to win a trip for two to Cancun, Mexico in their Cancun Bingo Giveaway! They want to reward loyal Online bingo players with a trip to the beautiful Mexican Caribbean for two! From September 1st – September 30th play this Canadian Dollar Bingo sunny promotion with $100,000 in Guaranteed Cancun Bingo Patterns and fantastic weekly prizes, because you and your lucky friend could be on your way to Cancun on them. Exciting right?! Now, let’s take a look at what you’ll be winning. The Grand prize includes FLIGHTS (2 round trip tickets) + plus 5 Days at the beautiful All Inclusive Paradisus HOTEL or $2,000 CASH USD. The choice is yours! Join Canadian Dollar Bingo for a Girls Weekend this March 8th-11th in honor of International Womens Day Bingo. They are going to “paint the room red” with OVER $15,000 in GUARANTEED JACKPOTS and lots of girly talk! The fun takes place in the main online bingo room all day long starting March 8th -11th, get ready for hours of themed $25-$250 GUARANTEED GAMES with prizes reaching up to $10,000 CASH. Wishing all of you a bingo-ful weekend as unique and special as you! Brrrr! Cold weather is blasting so come inside and play without freezing in the Bingo Snowman Challenge with a GUARANTEED $10,000 in CASH JACKPOTS, LOTS OF WEEKLY EXTRA PRIZES and a $1,000 BBS GRAND PRIZE DRAW. Keep warm all morning long by playing the Canadian Dollar Bingo Snowman Challenge games from 9am – 3pm because the chance of winning any of these JPs is more fair than ever… Cards are only $0.25 each, and players participating in these games will only be allowed max 48 cards each with a Buy 15 cards, Get 5 FREE offer. Starting this Jan Monday 1st, and until Feb Sunday 28th bingo on the Snowman Patterns to pack up snowballs and build your snowman — then decorate him! You will need: (1) Big Snow Ball, (1) Small Snow Ball, (1) Snowman Beanie, (1) Carrot, (1) Scarf, (2) Rocks, (2) Twigs, and (2) Buttons. • Prize #1: Double the daily bonus on the next (3) Deposits, regardless of the amount deposited. • Prize #2: Receive BACK in bonuses the total amount deposited over the week. For example, if you deposited $200, you will get 200 in bingobucks!!! • Prize #3: An EXTRA 100% Deposit Bonus on your next (4) Deposits, regardless of the amount deposited. • Prize #5: $100BBs Voucher to play your favorite games! The amount will be paid out in 4 $25BBs weekly installments. If no players complete the snowman during the weekly contest period, all entries during that week will be entered into a random draw. The more patterns you collect; the more chances you have to win! In addition to the weekly contest prizes, they will also be offering a $1,000 Bingo Bucks GRAND PRIZE. Every contest pattern won during the contest will automatically be entered into the Grand Prize Draw to be held March 5th, 2018. Since this is a random draw, one single contest pattern could make you the Grand Prize Winner!!! 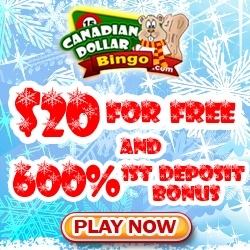 The Canadian Dollar Bingo special Christmas Themed Games will play TWO times per hour EVERY day, Dec 1st thru Dec 31st in our $100,000 Holidays Main Room. You could easily win jackpots from $25 to $100 with only a few cents! In addition to the special Christmas Themed Patterns, they will be running seasonal contests and exclusive Online bingo events. Don’t miss them! Happy Holidays! Players need to deposit $25 to enter this special room and proceed to register below. Must be registered by 9:00pm each nightly Online bingo event and have a deposit in the last 7 days to qualify. Grease back your hair or grab your poodle skirts, and get ready to bingo around the clock! The 1 cent bingo room has been revamped. Play games from just a 1 cent a card with increasing prize pools PAYING 100% BACK and a chance to hit the big $1,000 PROGRESSIVE JACKPOT. PLUS! Each bingo win at Canadian Dollar Bingo will qualify as one entry into the weekly raffle drawing for EXTRA PRIZES. With tickets this cheap, you don’t need to break the bank to play bingo anymore, turn your cents into dollars and have fun chatting in the main room. Play Online bingo 24/7 No Deposit Needed PRE-BUYS AVAILABLE .